Brother Smith is married with two married sons (both of whom are members of Lodge Dalkeith Kilwinning No.10) and two grandchildren. His hobbies include winning Grand Lodge golf cups and being another Hibernian F.C. season ticket holder. He is the Grand Almoner of the Grand Lodge of Scotland and a member of the Administration committee at Grand Lodge. He is representative of both the Grand Lodge of Texas and The Grand Lodge of China near the Grand Lodge of Scotland. Brother Kerley`s interests are Freemasonry, bowling and gardening, having his own allotment garden. He was employed as a manager in the book printing industry. He is a Hibernian F.C. season ticket holder and when not watching them manages to fit in time to be Session Clerk of St Martin`s Church, Portobello. He is married with two grown up sons. Brother Nutley, a retired Chartered Civil Engineer is an "Essex boy" whose main interests are Freemasonry, bowling and gardening with the odd game of golf when time permits. He has been President of West Lothian Bowling Association, Kirkliston Bowling Club and Linlithgowshire Masonic Bowling Association and now, with Brother Archie Chalmers of Ayrshire runs the annual Grand Lodge Bowls outing. He is married with a grown up son and daughter and to keep a balance with his Depute and Substitute Masters, holds a season ticket at Heart of Midlothian F.C. He is Representative of the Grand Lodge of Missouri near the Grand Lodge of Scotland. Brother William Nicol George Reid M.B.E. Brother Reid M.B.E, a Past Provincial Grand Master past away on the 9th October 2018. Brother Humphries was initiated into Lodge St Kentigern Penicuik & West Linton No. 429 in 1989 and was master in 2000, he is also a past master of the Loretto Centenary Lodge No. 1373. He is married with an adult son and daughter and also three grandchildren. He is now retired having served over forty years as an accountant in Local Government and amongst his hobbies still indulges in long distance running. 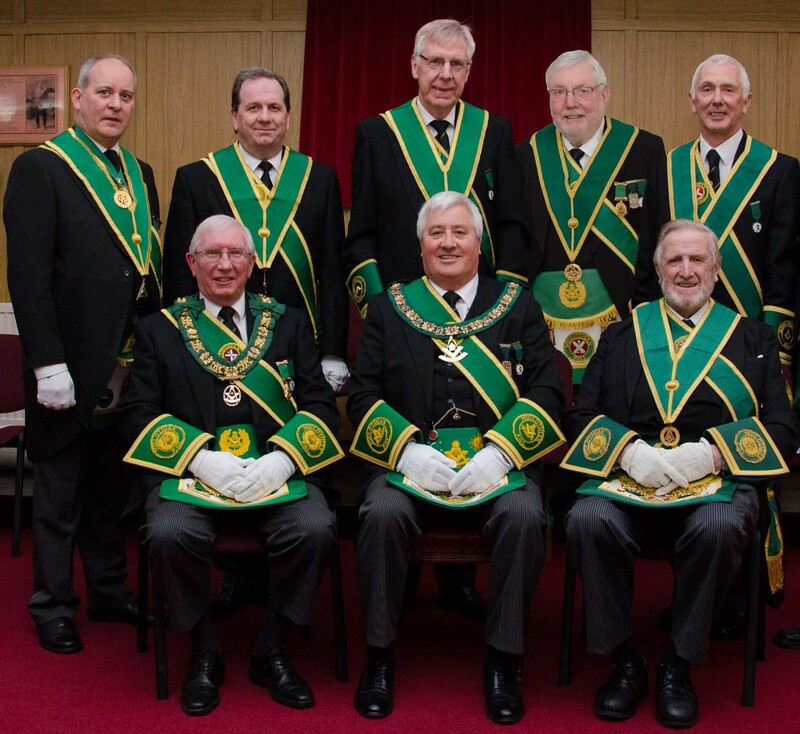 Not many Depute Provincial Grand Masters take part in such exertions and Brother Humphries will continue to seek the support of members in raising money for Provincial charities through his efforts. Brother Law was initiated into Lodge St John Fisherrow 112 in November 1974 as a Lewis following his father and grandfather into freemasonry. He was Master in 1994 some 50 years after his grandfather and proudly wears his PM`s jewel. He is a Financial Director with a large ironmongery company in Leith. He is married to Christine and has two sons. He enjoys motor sports, music and golf. Brother Harris was initiated into Lodge Dalkeith Kilwinning No 10 in 1984 and was Master thereof from May 2006 until May 2008. He has worked in a variety of positions within the Logistics function of a major brewing company for nigh on 38 years. When not working or enjoying his Freemasonry, he enjoys eating out, travelling and listening to music (live music preferably). He has followed the fortunes of Hibernian Football Club for nearly 50 years and is married with one grown up step son. Brother McFarland is married with a grown up son and daughter. He likes going on foreign holidays & cruise ships. Worked 33 years with the Post Office before taking voluntary redundancy, finishing up as a Post Office Branch Manager. Now works for Edinburgh District Council in `Parking Services`, a Hibs Season ticket holder. In his`younger` years done a lot of sport.. achieved a `black belt` in Karate. played squash, golf , football & worked out at the gym. A PM of Lodge Royal Thistle (The Royal Scots) No.1338 and Lodge Loretto Centenary No.1373 and holds Hon Grand rank of Director of Ceremonies.